Find out why plasmid copy number control and multiple plasmid systems are so important, what is SynORI, how does it work, and where you can apply it. SynORI stands for synthetic origin of replication. It is a framework designed to make working with single and multi-plasmid systems precise, easy and on top of that - more functional. Picking the type of copy number control (specific to one group or regulating all of them at once). The framework also includes a possibility of adding a selection system that reduces the usage of antibiotics (only 1 antibiotic for up to 5 different plasmids!) and an active partitioning system to make sure that low copy number plasmid groups are not lost during the division. A multi-plasmid system that is easy to assemble and control. With our framework the need to limit your research to a particular plasmid copy number just because there are not enough right replicons to choose from, is eliminated. With SynORI you can easily create a vector with a desired copy number that suits your needs. 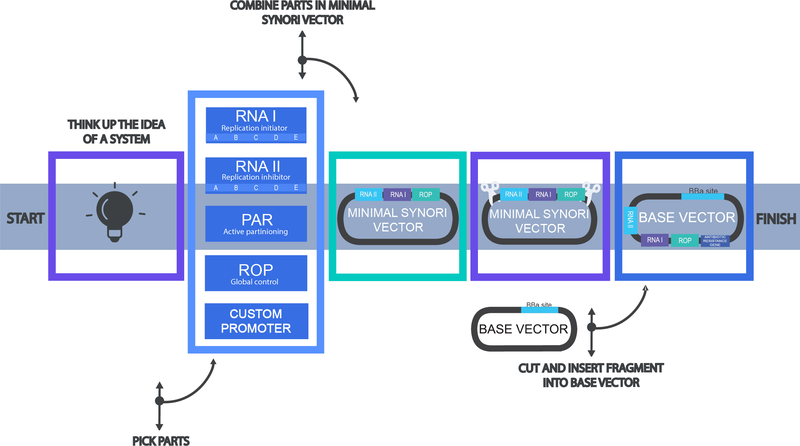 The ability to choose a wide range of copy number options and their control types will make the synthetic biology engineering much more flexible and predictable. Introduction of plasmid copy number regulation is equivalent to adding a global parameter to a computer system. It enables the coordination of multiple gene group expression. The co-expression of multi-subunit complexes using different replicons brings incoherency to an already chaotic cell system. This can be avoided by using SynORI, as in this framework every plasmid group uses the same type of control, and in addition can act in a group-specific manner. A big challenge for heterologous expression of multiple gene pathways is to accurately adjust the levels of each enzyme to achieve optimal production efficiency. Precise promoter tuning in transcriptional control and synthetic ribosome binding sites in translational control are already widely used to maintain expression levels. In addition to current approaches, our framework allows a simultaneous multiple gene control. Furthermore, an inducible regulation that we offer, can make the search for perfect conditions a lot easier.